The purpose of Applied Geothermics for Petroleum Engineers is to present in a clear and concise form methods of utilizing the data of temperature surveys in deep boreholes as well as the results of field, laboratory and analytical investigations in geothermics to a wide audience. Although some aspects of the subject of this book have been discussed in several previous books and numerous papers, Applied Geothermics for Petroleum Engineers is the first book on this topic available to the petroleum engineering community. The objective of the book is to present the state of knowledge and prediction of downhole and formations temperatures during well drilling, well completion, shut-in and production. 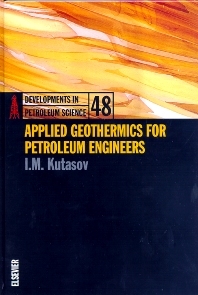 Applied Geothermics for Petroleum Engineers is intended for drilling engineers (impact of elevated temperatures on well drilling and completion technology, Arctic drilling), production engineers (temperature regime of production, injection and geothermal walls, Arctic production), reservoir engineers (temperature field of reservoirs, thermal properties of formations and formation fluids), well logging engineers (interpretation of electrical resistance, mud density, and temperature logs), and geophysicists and geologists (interpretation of geophysical data, calculation of the terrestrial heat flow, reconstruction of past climates).